NEW YORK, NY– February 6, 2018 – The Tribeca Film Festival, presented by AT&T, will open its 17th edition with the world premiere of LOVE, GILDA on Wednesday, April 18, 2018. 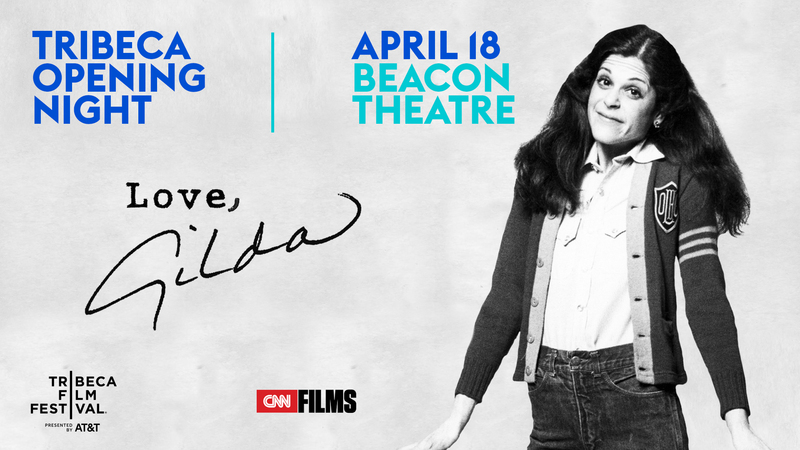 CNN Films presents the feature length documentary – produced by 3 Faces Films in association with Motto Pictures – which opens a window into the world of celebrated Emmy® and Grammy® award-winning comedian Gilda Radner who became a cultural icon the moment audiences first laughed with her on Saturday Night Live’s debut episode. A trailblazer for female comedians, her impact on the entertainment industry has endured almost four decades. The film will premiere opening night of the Tribeca Film Festival at the Beacon Theatre in New York City, the city she called home when she catapulted to fame. Tickets for Opening Night go on sale on March 20 at www.tribecafilm.com/festival. The 2018 Tribeca Film Festival runs April 18-29. LOVE, GILDA is directed and produced by Lisa D’Apolito with the support of the Gilda Radner estate. The film is a true autobiography of a pioneering woman, told in her own words and in her own voice. It weaves together audiotapes, rare home movies, diary entries, and interviews with her friends and those inspired by her including: Bill Hader, Amy Poehler, Maya Rudolph, and Cecily Strong; SNL original cast members Chevy Chase, Laraine Newman, and Paul Shaffer; as well as Lorne Michaels (SNL creator and producer), Alan Zweibel (SNL writer), Stephen Schwartz (Broadway composer); Andrew Alexander (CEO of Second City), and long-time friend and actor Martin Short. Gilda Radner captivated millions of television viewers as an original cast member of Saturday Night Live from 1975-1980. The popularity of her now classic comedic characters Roseanne Roseannadanna, Emily Litella, and Lisa Loopner fueled the young talent to meteoric fame in television, movies, and on Broadway. After finding happiness in love with Gene Wilder she received the cruelest joke of all, cancer. Her fight against the disease served as an inspiration to people impacted by the illness to stay positive and to keep laughing no matter what challenges life brings you. LOVE, GILDA brings audiences into the honest and whimsical world of a beloved performer, whose greatest role was sharing her story. The film is produced by Bronwyn Berry, Meryl Goldsmith, and James Tumminia, with Julie Goldman, Christopher Clements, Carolyn Hepburn (Motto Pictures), Alan and Robin Zweibel, Amy Entelis and Courtney Sexton (CNN Films) serving as executive producers. Submarine is handling sales for the film. The 2018 Tribeca Film Festival will announce its feature film slate on March 7.